When you’re hosting an important event, you need show-stopping, mouthwatering food that pleases your guests and makes the time memorable. Food from a great Singapore caterer is a good start; but why not take things to the next level, with live food stations from your catering service in Singapore? Live stations provide a centre of interest, a gathering point where people can observe the cooking process and chat together while anticipating their delicious meal. Find out how to include food stations at your next event. 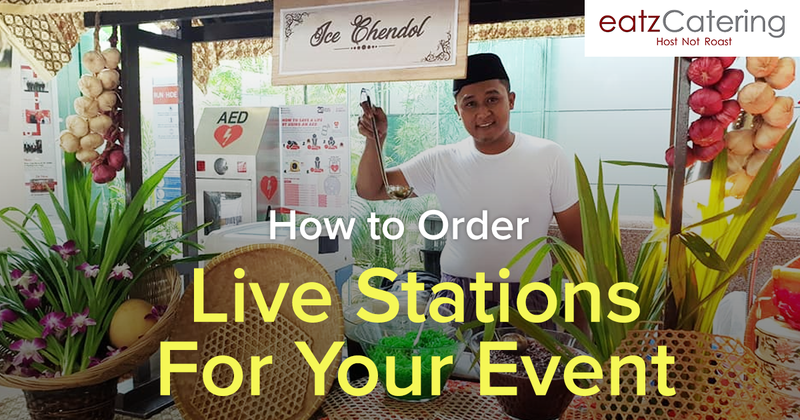 Before you select or order a live station or two, check with the venue at which you plan to host your event. You’ll need to ensure that there’s enough space for the buffet, the live stations, and the tables and chairs for your guests. Also, some indoor venues may have rules about food being cooked in the space, while others may have limited electrical outlets to accommodate the food stations. Think ahead and ensure that your live station will work in the venue you’ve chosen. If it’s not going to work out, consider selecting a venue that’s more flexible, with enough space and amenities to accommodate the stations you want. Eatz Catering has dozens of live station options available, so you’re sure to find something that will enchant and entice your guests. Try the classic Nonya Laksa or Nonya Mee Siam stations, which offer delicious Peranakan comfort foods. The Hainanese chicken rice always pleases the guests; while the Hokkien prawn noodle soup live station is a welcome addition to any event. Eatz Catering provides live stations featuring Chicken Congee with peanuts, Dim Sum combos, fish ball skewers, Mee Rebus with gravy, fried carrot cakes with egg, hot dogs, grilled chicken satay, and various kinds of pasta. There are even stations with ice cream cones, fresh-baked waffles, crepes, churros, candy floss, or popcorn. Whatever buffet or even theme you choose, you’re sure to find a live food station to go with it. If you’re also ordering a buffet from Eatz Catering, you can easily add a live food station or two when you place the order. First, go online to the Eatz Catering website and explore the buffet options. You’ll be able to choose a menu, select from the available dishes, and add that buffet to your cart. Then you can visit the Live Stations page and pick the ones you want. Add them to your cart as well, and then follow the simple steps to check out. If you do not plan to order a full buffet, you’ll need to order at least two live stations for your event. But you don’t have to stop there! Go with three or four stations to boost the level of excitement and fun for your party. If you have any questions related to the buffets, the food stations, or your other catering needs, please contact us! We’re happy to provide you with more information and help you figure out any additional details for your event.